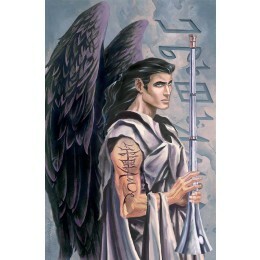 This Gabriel was adapted for The Book of Angels for Barnes & Noble. Gabriel-The Voice of God is an Open Edition Print. The Archangel Gabriel is known as the Angel of the Annnunciation, Resurrection and Revelation. His name, "God is My Strength" is inscribed ont the wall behind him and shown in angelic script on his right arm. I have depicted him holding the great horn Emdheni, and his dark peacock colored wings.